Welcome to my blog, where I explore leadership characteristics. Here I draw on my own leadership experience and observations from my work as an executive coach. I hope you tried out gratitude after reading my last blog. If you did, I am certain you are already seeing a difference in your self-awareness, your resilience levels and your energy levels. You could say I am curious about leaders and the qualities of the best leaders. But, I am curious about many more things and I want to encourage you to develop your skills of curiosity also. 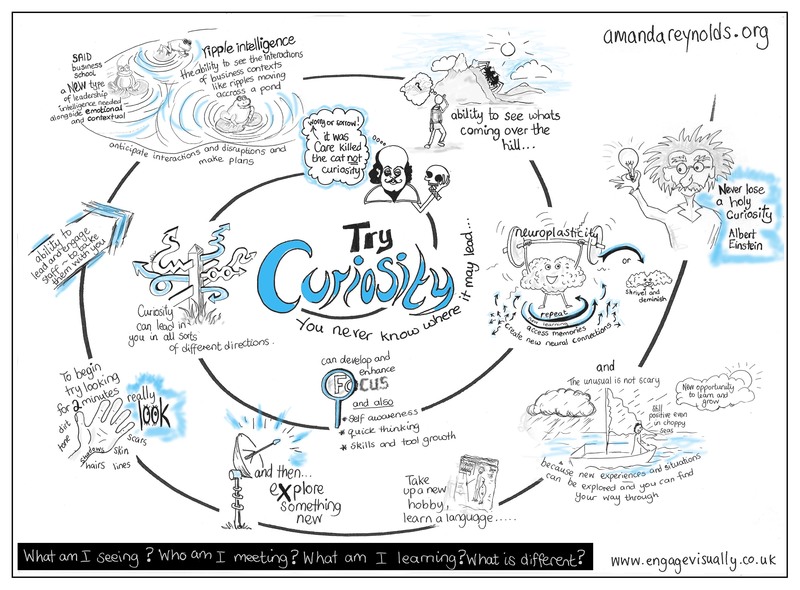 In addition to gratitude I think curiosity is an important and under developed skill for leaders. So, do read on, but if your short on time do have a look at this graphic that captures the key messages. Take something apart, look inside see what’s there and how it all fits together and then try and put it back together – make sure it’s belongs to you first or family and friends may not thank you. Ask someone different to you what the latest movie was they saw, go see it. Take up a hobby, not one you’ve done before though, or, learn a language or try painting. Go to a different restaurant, pub or holiday spot. Join a group or volunteer. This entry was posted in coaching, strategy on February 28, 2015 by areyns.